Angel’s Touch is a simple, but very enjoyable slot by Amaya. On this slot, everything is about bonus games, which can be clearly seen when considering the possibility of increasing your wager to get better odds of winning a bonus. This, however, isn’t anything new under the sun. For example, free spin multipliers can, impressively so, reach 20 times your initial profit. It, therefore, makes sense that Amaya has put emphasis on bonuses. Most symbols used in this game are standard, and so is the layout of the game. The simplicity of this slot, in combination with it many bonuses, makes it a success. How to play Angel’s Touch? Angel’s Touch has a standard layout with five turning wheels and three rows. However, what is really standard, the symbols on the turning wheels range from nines to aces. All the other animations and all sound effects have to do with angels. The wild symbol used in this game cannot be missed since it actually says “wild”. This wild symbol can be any other symbol, but an angel. This is because angel symbols are used to instigate a bonus. Therefore, to keep angels more sparse , wild symbols cannot replace angels. When you get a scatter symbol three times on Angel’s Touch, it gets really interesting. Namely, you will encounter eight clouds and you have to pick which one you would like. 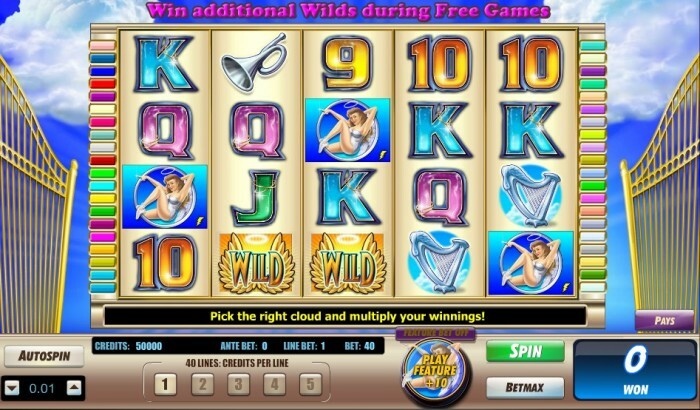 These clouds possibly contain extra wild symbols, but also extra multipliers to be used during free spins. The game lets you pick clouds until you have chosen a cloud with the devil twice. After your second devil, you immediately start playing with your newly won free spins. You play your free spins on the same turning wheels. Hopefully, you won’t have just one scatter symbol, but as much as three, leading to big winnings quickly! When you’ve really hit the proverbial jackpot, you can play with a multiplier of 20. However, even if your multiplier is just 5, your profit will reach incredible heights too! While playing your free spins, you might just even win more free spins. Do note that you might want to turn off the volume during these spins. Also, pay attention to the fact that your chances of winning a bonus significantly increase when you turn on the “ante”. This will also mean that you have higher wagers while playing normal spins. Angel’s Touch has a total of 40 pay lines, which cannot be altered while playing. This means that you always play with these 40 pay lines. When you have turned on the ante, you thus play with ten credits more. You can alter the value of your credits in the bottom left corner of your screen. Also, at the center bottom of the screen, you will find the possibility to select a number ranging from one to five. These numbers represent how many credit you wager per pay line. The slot also has an auto spin function. Luckily, this auto play function switches itself off when it reaches free spins. This turning off of this function has everything to do with the fact that you need to select clouds first.